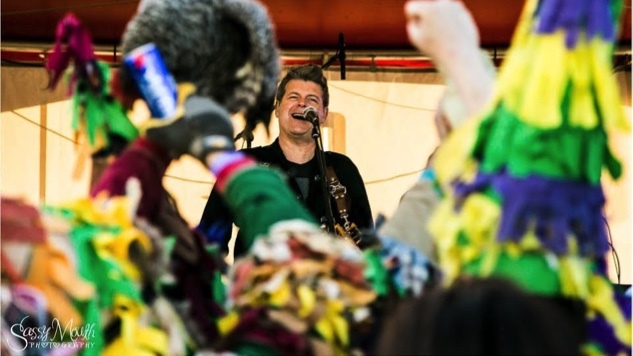 The Resilience of Cajun Music: Steve Riley and Eunice, La. Mardi Gras is French for Fat Tuesday, the last day in the Catholic calendar for enjoying oneself before Ash Wednesday and the renunciations of Lent. But in South Louisiana one day is not enough of a party, so they stretch the Mardi Gras season out for weeks; the day before is even called Lundi Gras—or Fat Monday. And at the Lakeview Park & Beach, an RV park between Eunice and Mamou, Louisiana, Lundi Gras caps off a long weekend of live Cajun and Creole music with a show by the Acadiana region’s top band, Steve Riley & the Mamou Playboys. In the park’s dancehall—an old barn with weathered siding and exposed rafters—this quintet is singing in French and pushing and pulling at the rhythm with fiddle and guitar, prodding the crowded room into action. “Allons danser,” Riley cries over his own button-accordion riff, as couples pair off for two steps, waltzes and blues. The thermometer has dipped into the 30s on this unusually cold March evening, and the band, like the audience, is wrapped in woolen hats, scarfs, sweaters and fingerless gloves, as the space heaters work to fight off the chill. More effective than the machines, however, is the body heat generated by the musicians and dancers alike, and the layers of extra clothing soon come off, piece by piece. The entire event becomes a collaborative effort between the performers and listeners. The band sounds different at home than it does at an out-of-state performing arts center, because the musicians respond to an audience that not only wants to dance but also knows how and why. And the audience responds in turn to the tunes sung in French and played on fiddles, accordions and guitars, because it sounds like home and nowhere else. The culture cements the community, and the community feeds the culture. This was most obvious when the Mamou Playboys sang “La Danse de Mardi Gras,” the ancient anthem for the Fat Tuesday celebrations. It was made famous by the Cajun music pioneers the Balfa Brothers, and Riley learned it directly from the master fiddler/singer Dewey Balfa while playing in the latter’s final band. The song’s haunting modal melody has roots in Celtic France, where the Acadians lived before emigrating to Nova Scotia and then South Louisiana, and the French lyrics describe how the rural French tradition of Carnival was adapted by the farmers who settled along the Gulf Coast. “Capitaine, capitaine, voyage ton flag,” Riley sang at Lakeview in an echo of the Balfas, and the dancers in front of him sang the words with him. “Allons chez un autre voisin; demandé la charité pour les autres qui viennent nous rejoindre,” “Captain, captain,” they’re saying, “wave your flag. Let’s go to the next neighbor and request a gift for those who will be joining us” at the feast. The next day these instructions for a traditional Mardi Gras celebration were carried out to the letter by a group of young musicians led by Joel Savoy, his brother Wilson and Jourdan Thibodeaux through St. Landry and Evangeline Parishes. Everyone was in costume and mask, mostly dressed in screen-door-wire masks and pajamas dripping with strips of colored cloth, though there were dozens and dozens of variations on this simple model. Thibodeaux, the Mardi Gras captain in a purple and white satin cape, led the way on horseback down a two-lane blacktop to a neighboring farm. He road up to the farmer and formally asked permission to come onto the property. When he waved his flag, all the Mardi Gras (the name for the participants as well as the holiday) rushed up and knelt on the muddy lawn before the family who lived there. The farmer offered a chicken for the gumbo pot but announced that we’d have to catch it. He threw the bird in the air and the younger revelers went tear-assing in pursuit. The musicians on the band wagon struck up a two-step; costumed couples began dancing on the lawn, and many took a swig from a flask to keep warm. Then it was down a gravel road to the next farm, where the whole thing was repeated, and finally down a grass track to a farm where the Mardi Gras were challenged to climb a greased pole to capture the chicken in a cage at the top. Someone served hot boudin—the spicy sausage-and-rice Cajun dish—from the back of a pick-up truck. The final stop was a small cemetery, where we found the grave of Dennis McGee, the fiddler who made seminal Cajun/Creole recordings in 1929 with Amedee Ardoin. The boisterous revelers quieted enough to hear the wind whistle across the cane fields. Thibodeaux delivered a short sermon about the dual nature of Mardi Gras—how the reckless abandon of Fat Tuesday is hollow without the repentance of Ash Wednesday, how the good times at any time of year don’t mean as much without the bad times, how the chicken-chasing part of the day’s festivities are balanced by the somberness of the graveyard. With that, he joined the Savoy brothers in a medley of McGee’s ancient tunes. If you live outside Louisiana, you could be forgiven for thinking that Cajun and zydeco music have dwindled away. In the ‘80s and ‘90s, there were Cajun and zydeco dances and concerts up and down the East Coast as well as the West. There were critically acclaimed recordings from Rounder, Arhoolie and others. But the collapse of the recording industry hit this scene particularly hard, and the fad for all things Louisiana seemed to fade as most imported enthusiasms do. But the music didn’t disappear. It just retreated into its home territory, as all smart guerilla movements do. In Lafayette and the dozens of small towns surrounding it, the music is as strong as ever. Perhaps stronger, because the musicians are touring less often and in the local dancehalls more frequently, strengthening that bond between the music and its community. It was obvious how well it was working at the Lakeview. Though Riley takes most of the lead vocals, fiddler Kevin Wimmer and guitarist Sam Broussard do a good job when their turns come around, and the three voices blend with years of practice. These three soloists aren’t content with the simple variations that many of the region’s musicians settle for but seem to always be reaching for a new note, a new chord. Anchoring them to the ground is the rock-solid rhythm section of drummer Kevin Dugas and bassist Brazos Huval. When it all comes together, as it did at the Lakeview during their most popular song “Bon Reve,” the title track from the band’s 2003 album. The song not only describes the “sweet dream” of a working-class community that shuts off the TV, gets off the couch and goes down to the dancehall for drinking, waltzing and flirting, but it also brings it into being. When the band’s three singers align their voices for the “whoa-whoa-whoa-whoa-whoa” refrain, the dancers in the barn joined in too. Soon the whole room was moving to the same beat and singing the same words, the best possible demonstration between a music and its audience. Cajun music’s profile may have diminished on the two coasts, but it has hunkered down at home, drawing new vitality from its community, ready to emerge stronger than ever when the opportunity arises.